Ahsaine, A.H.; Slassi, A.; Naciri, Y.; Chennah, A.; Jaramillo‐Páez, C.; Anfar, Z.; Zbair, M.; Benlhachemi, A.; Navío, J.A. This work reports the synthesis of nanocrystalline ZnO and 5% La‐doped ZnO (La/ZnO) materials for photo/electrocatalytic degradation of Rhodamine B. The samples were characterized by X‐Ray diffraction, scanning and transmission electron microscopy, X‐Ray photoelectron spectroscopy and diffuse reflectance spectra. The effect of La doping on electronic structure was investigated using density functional theory calculations (DFT), La‐doped ZnO showed an n‐type metallic nature compared to pristine ZnO and La doping creates occupied states within the band gap edge. Under UV light, La/ZnO showed higher kinetic constant and efficiency than ZnO. A possible mechanism was elaborated on the basis of DFT and active trapping measurements. Different initial Rhodamine B concentration were studied to assess the electro‐oxidation of RhB. The electrochemical degradation of RhB over La/ZnO spindles electrode was pronounced with three time's high kinetic constant. The superior electro/photoactivity of La/ZnO was due to its unique morphology, high charge separation of the charge carriers and higher conductivity induced by La‐doping (intermediary levels). Superoxide ions and holes were the main active species for the photodegradation. Whereas, synergetic effect of hydroxyl radicals and hypochlorite ions were responsible of the high RhB electrocatalytic degradation. The development of Deep Geological Repositories (DGP) to the storage of high-level radioactive waste (HLRW) is mainly focused in systems of multiple barriers based on the use of clays, and particularly bentonites, as natural and engineered barriers in nuclear waste isolation due to their remarkable properties. Due to the fact that uranium is the major component of HLRW, it is required to go in depth in the analysis of the chemistry of the reaction of this element within bentonites. The determination of uranium under the conditions of HLRW, including the analysis of silicate matrices before and after the uranium-bentonite reaction, was investigated. 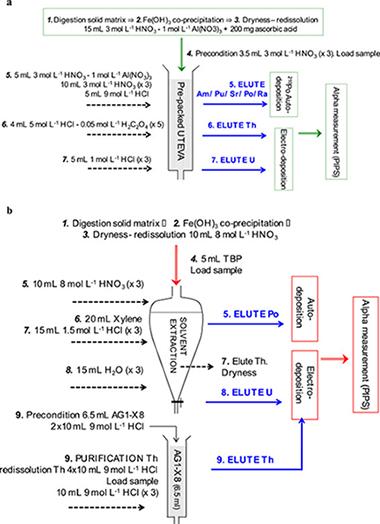 The performances of a state-of-the-art and widespread radiochemical method based on chromatographic UTEVA resins, and a well-known and traditional method based on solvent extraction with tri-n-butyl phosphate (TBP), for the analysis of uranium and thorium isotopes in solid matrices with high concentrations of uranium were analysed in detail. In the development of this comparison, both radiochemical approaches have an overall excellent performance in order to analyse uranium concentration in HLRW samples. However, due to the high uranium concentration in the samples, the chromatographic resin is not able to avoid completely the uranium contamination in the thorium fraction. 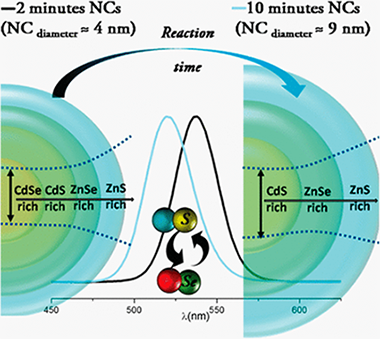 Compositional changes taking place during the synthesis of alloyed CdSeZnS nanocrystals (NCs) allow shifting of the optical features to higher energy as the NCs grow. Under certain synthetic conditions, the effect of those changes on the surface/interface chemistry competes with and dominates over the conventional quantum confinement effect in growing NCs. These changes, identified by means of complementary advanced spectroscopic techniques such as XPS (X-ray photoelectron spectroscopy) and XAS (X-ray absorption spectroscopy), are understood in the frame of an ion migration and exchange mechanism taking place during the synthesis. Control over the synthetic routes during NC growth represents an alternative tool to tune the optical properties of colloidal quantum dots, broadening the versatility of the wet chemical methods. This work is focused on the use of the Calcium-Looping process (CaL) in Concentrated Solar Power (CSP) plants for Thermochemical Energy Storage (TCES). Cheap, abundant and nontoxic natural carbonate minerals, such as limestone and dolomite, can be employed in this application to store energy through the cyclic calcination/carbonation of CaCO3. In a recent work, a closed CO2 cycle has been proposed for an efficient CaL-CSP integration in which the CO2 in excess effluent from the carbonator is used to generate electricity by means of a gas turbine. Process simulations show that the thermoelectric efficiency is enhanced as the carbonator pressure and temperature are increased provided that the multicycle CaO conversion is not affected. On the other hand, the use of just one reactor for both calcination and carbonation has been suggested to reduce capital cost. However, the experimental results shown in the present work indicate that sintering is notably enhanced as the pressure in the reactor is increased. Such an adverse effect is mitigated for a ZrO2/CaCO3 composite with a low Zr content as compared to natural carbonates. These results are relevant to process simulations for better assessing the global efficiency of the CaL-CSP integration. The singular properties of lanthanide-based inorganic nanoparticles (NPs) has raised the attention of the scientific community in biotechnological applications. In particular, those systems with two or more functionalities are especially interesting. In this work, an effective and commercially attractive procedure has been developed that renders uniform, water-dispersible Ln(3+):CeF3 (Ln = Tb, Nd) NPs with different shapes and size. The method consists of the homogeneous precipitation, in a mixture of polyol and water, of cations and anions using precursors that allow the controlled release of the latter. The advantages of the reported method are related to the absence of surfactants, dispersing agents or corrosive precursors as well as to the room temperature of the process. The obtained Tb:CeF3 NPs produce an intense emission after excitation through the Ce-Tb energy transfer band located in the UV spectral region, thus being potentially useful as phosphors for in-vitro imaging purposes. On the other hand, the synthesized Nd:CeF3 NPs are good candidates for in-vivo imaging because their excitation and emission wavelengths lie in the biological windows. Finally, the excellent X-ray attenuation efficacy of the Nd:CeF(3)NPs is shown, which confers double functionality to this material as both luminescence bioprobe and contrast agent for X-ray computed-tomography. Three mono and bimetallic NixCo1-x/SBA-15 catalysts (x = 1, 0.5 and 0) with a total metallic content of 10 wt% have been prepared by a deposition-precipitation (DP) method. The catalytic performances on the dry reforming of methane reaction (DRM) have been determined and correlated with their physical and chemical state before and after the catalytic reaction. So, while the nickel monometallic system presents a high activity and stability in the DRM reaction, the Co/SBA-15 catalytic system turns out completely inactive. For its part, the Ni0.5Co0.5/SBA-15 has initially a catalytic performance similar to the Ni/SBA-15 monometallic system, but rapidly evolving to an inactive system, therefore resembling the behavior of the cobalt-based catalyst. 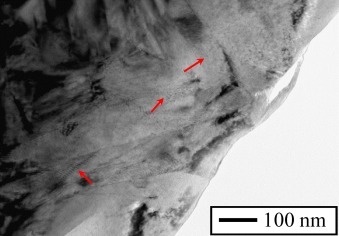 The characterization by TEM and in situ XPS techniques has allowed us to ascribe these differences to the initial state of metallic particles after reduction and their different evolution under reaction conditions. So, while after reduction both nickel containing NixCo1-x/SBA-15 catalysts (x = 1 and 0.5) present a well dispersed metallic phase, the cobalt monometallic catalyst yields big metallic particles with a heterogeneous distribution of sizes. Additionally, unlike the Ni/SBA-15, the NiCo/SBA-15 system increases during reaction the metallic particle sizes. Besides indicating that the particle size is a major reason determining the catalytic performances, these results suggest that in the Ni-Co system both metals form after reduction a bimetallic phase mainly located inside the mesoporous channels of SBA-15 support. Under DRM reaction conditions, the cobalt is segregated to the surface of the bimetallic particles, which seems to determine the interaction with the support surface SBA-15. This feature gives rise to a much less stable metallic phase which suffers an important sintering process under DRM catalytic conditions. 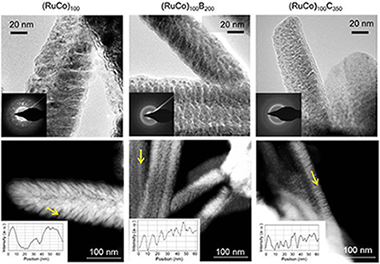 In this work, we prepared a series of Ni foam supported Ru-Co, Ru-Co-B and Ru-Co-C catalysts in the form of columnar thin films by magnetron sputtering for the hydrolysis of sodium borohydride. We studied the activity and durability upon cycling. We found a strong activation effect for the Ru-Co-C sample which was the highest ever reported. This catalyst reached in the second cycle an activity 5 times higher than the initial (maximum activity 9310 ml.min(-1).g(CoRu)(-1) at 25 degrees C). Catalytic studies and characterization of the fresh and used samples permitted to attribute the strong activation effect to the following factors: (i) small column width and amorphous character (ii) the presence of Ru and (iii) dry state before each cycle. 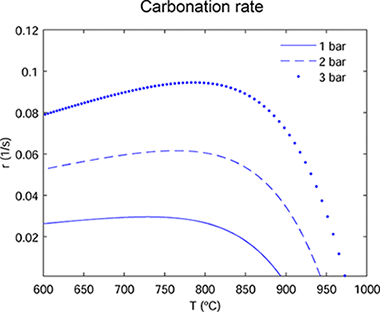 The presence of boron in the initial composition is detrimental to the durability. Our studies point out to the idea that after the first cycle the activity is controlled by surface Ru, which is the most active of the two metals. Apart from the activation effect, we found that catalysts deactivated in further cycles. We ascribed this effect to the loss of cobalt in the form of hydroxides, showing that deactivation was controlled by the chemistry of Co, the major surface metal component of the alloy. Alloying with Ru is beneficial for the activity but not for the durability, and this should be improved. 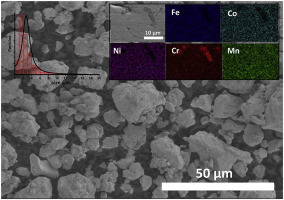 FeCoNiCrMn(Al)-based powdered high entropy alloys were synthesized by a short time mechanical alloying process in a high energy planetary ball milling from mixtures of elemental powders, and subsequently sintered by a pressureless procedure. The composition and microstructure of the HEA phases before and after the sintering process were studied by X-ray diffraction, energy dispersive X-ray analysis (EDX) and scanning electron microscopy. The microhardness and tensile strength values for Fe1,8Co1,8Ni1,8Cr1,8Mn1,8Al1,0 HEA sintered at 1400 degrees C sample were 3,7 GPa and 1011 MPa, respectively. Statistical Fisher-Pearson coefficient of skewness and kurtosis were played to determine the optimum synthesis milling time. The use of NaCl as additive led on to a reduction of the as-milled grain size. After sintering, SEM study confirmed a segregation of the initial HEA phase directly related to the melting temperature of the elements. Three melting temperature groups were described (Cr, FeCoNi and Mn) and they agree with the observation in the elemental mapping study. The presence of Al favored the segregation of Cr. The most advanced applications of clays depend crucially on their hydration state and swelling is probably the most important feature of expandable 2:1 layered silicate. 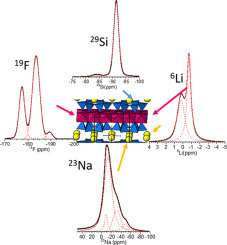 Sodium Taeniolite, Na-TAE, a swelling trioctahedral fluormica, has been synthesized and studied using thermogravimetric analysis, X-ray diffraction, scanning electron microscopy and infrared and solid state NMR spectroscopies. The results indicated the formation of a swelling 2:1 phyllosilicate with actual layer charge lower than the nominal one. Herein, a new heteroatom distribution and more accurate composition could be deduced. The selective incorporation of deposition species with preferential directionality is analyzed during the growth of TiO2 thin films by magnetron sputtering. Using wisely-designed collimators, tilted nanocolumnar morphologies are grown in a ballistic deposition regime, i.e. when most deposition species arrive at the film surface along well-defined preferential directions, and also in a thermalized deposition regime, when these species follow an isotropic momentum distribution in the plasma gas. The obtained results suggest that the use of particle collimators may promote the growth of porous thin films even in the classical magnetron sputtering configuration, when the target and the substrate are parallel. General insights are given on this approach and, as a proof of concept, its principles applied for the synthesis of nanostructured films in a laboratory-size reactor. 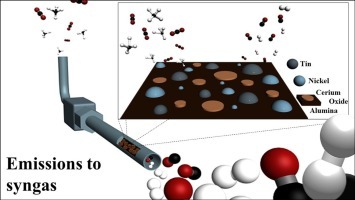 Carbon formation and sintering remain the main culprits regarding catalyst deactivation in the dry and bi-reforming of methane reactions (DRM and BRM, respectively). 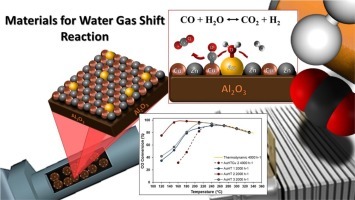 Nickel based catalysts (10 wt.%) supported on alumina (Al2O3) have shown no exception in this study, but can be improved by the addition of tin and ceria. The effect of two different Sn loadings on this base have been examined for the DRM reaction over 20 h, before selecting the most appropriate Sn/Ni ratio and promoting the alumina base with 20 wt.% of CeO2. This catalyst then underwent activity measurements over a range of temperatures and space velocities, before undergoing experimentation in BRM. It not only showed good levels of conversions for DRM, but exhibited stable conversions towards BRM, reaching an equilibrium H-2/CO product ratio in the process. In fact, this work reveals how multicomponent Ni catalysts can be effectively utilised to produce flexible syngas streams from CO2/CH4 mixtures as an efficient route for CO2 utilisation. le Sache, E.; Santos, J. L.; Smith, T. J.; Centeno, M. A.; Arellano-Garcia, H.; Odriozola, J. A.; Reina, T. R.
The dry reforming of methane with CO2 is a common route to transform CO2/CH4 mixtures into added value syngas. Ni based catalysts are highly active for this goal but suffer from deactivation, as such promoters need to be introduced to counteract this, and improve performance. In this study, mono- and bi-metallic formulations based on 10 wt.% Ni/CeO2-Al2O3 are explored and compared to a reference 10 wt.% Ni/gamma-Al2O3. The effect of Sn and Pt as promoters of Ni/CeO2-Al2O3 was also investigated. The formulation promoted with Sn looked especially promising, showing CO2 conversions stabilising at 65% after highs of 95%. Its increased performance is attributed to the additional dispersion Sn promotion causes. Changes in the reaction conditions (space velocity and temperature) cement this idea, with the Ni-Sn/CeAl material performing superiorly to the mono-metallic material, showing less deactivation. However, in the long run it is noted that the mono- metallic Ni/CeAl performs better. As such the application is key when deciding which catalyst to employ in the dry reforming process. 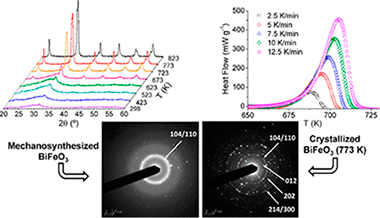 A series of gold colloids were prepared and immobilized on commercial activated carbon. The influence of the colloid preparation and stability were studied and related to the gold particle size in the final catalyst. The catalysts show an important activity in the glucose to gluconic acid oxidation reaction, leading to gluconic acid yield close to 90% in base free mild conditions (0.1 MPa O-2 and 40 degrees C). The size-activity correlation and probable mechanism were also discussed. Finally, the viability of the catalyst was tested by recycling it up to four times. A novel (beta + gamma)-TiNbTa alloy has been developed by a combined low energy mechanical alloying (LEMA) and pulsed electric current sintering process (PECS). Microstructurally, this material presents interesting characteristics, such as a submicrometric range of particle size, a body-centered phase (beta-TiNbTa) and, mainly, a novel face-centered cubic Ti-based alloy (gamma-TiNbTa) not previously reported. Related to mechanical performance, the novel (beta + gamma)-TiNbTa shows a lower E (49 +/- 3 GPa) and an outstanding yield strength (sigma(y) 1860 MPa). 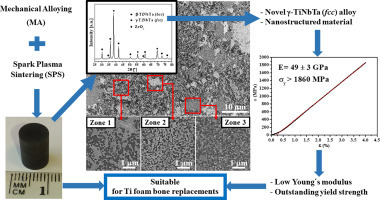 This combination of original microstructure and properties makes to the (beta + gamma)-TiNbTa a novel material potentially suitable as biomaterial to fabricate bone replacement implants, avoiding the undesirable and detrimental stressshielding problem and even the usual damage on the mechanical strength of Ti-based foams biomaterials. 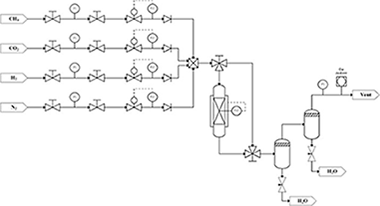 Clean hydrogen production via WGS is a key step in the development of hydrogen fuel processors. Herein, we have designed a new family of highly effective catalysts for low-temperature WGS reaction based on gold modified copper-zinc mixed oxides. Their performance was controlled by catalysts' composition and the Au-Cu synergy. The utilization of hydrotalcite precursors leads to an optimal microstructure that ensures excellent Au and Cu dispersion and favors their strong interaction. From the application perspective these materials succeed to overcome the major drawback of the commercial WGS catalysts: resistance towards start/stop operations, a mandatory requisite for H-2-powered mobile devices. High power impulse magnetron sputtering (HiPIMS) technology has been employed to prepare TiC/a-C:H nanocomposite coatings from a titanium target in acetylene (C2H2) reactive atmospheres. Gas fluxes were varied from 1.3 to 4.4 sccm to obtain C/Ti ratios from 2 to 15 as measured by electron probe microanalysis (EPMA). X-ray diffraction and transmission electron microscopy demonstrate the presence of TiC nanocrystals embedded in an amorphous carbon-based matrix. The hardness properties decrease from 17 to 10 GPa as the carbon content increases. The tribological properties were measured using a pinon-disk tribometer in ambient air (RH = 30-40%) at 10 cm/s with 5 N of applied load against 6-mm 100Cr6 balls. The friction coefficient and the film wear rates are gradually improved from 0.3 and 7 x 10(-6) mm(3)/N m to 0.15 and 2 x 10(-7) mm(3)/N m, respectively, by increasing the C2H2 flux. To understand the tribological processes appearing at the interface and to elucidate the wear mechanism, microstructural and chemical investigations of the coatings were performed before and after the friction test. EPMA, X-ray photoelectron and electron energy-loss spectroscopies were employed to obtain an estimation of the fraction of the a-C:H phase, which can be correlated with the tribological behavior. Examination of the friction counterfaces (ball and track) by Raman microanalysis reveals an increased ordering of the amorphous carbon phase concomitant with friction reduction. The tribological results were compared with similar TiC/a-C(:H) composites prepared by the conventional direct current process. This work presents results in the field of advanced substrate solutions in order to achieve high crystalline quality group-III nitrides based heterostructures for high frequency and power devices or for sensor applications. With that objective, Low Temperature Co-fired Ceramics has been used, as a non-crystalline substrate. Structures like these have never been developed before, and for economic reasons will represent a groundbreaking material in these fields of Electronic. In this sense, the report presents the characterization through various techniques of three series of specimens where GaN was deposited on this ceramic composite, using different buffer layers, and a singular metal-organic chemical vapor deposition related technique for low temperature deposition. Other single crystalline ceramic-based templates were also utilized as substrate materials, for comparison purposes. Crystallization is one key aspect in the resulting properties of nanocrystalline functional materials, and much effort has been devoted to understanding the physical mechanisms involved in these processes as a function of temperature. The main problems associated with crystallization kinetic studies come from the limitations of the employed techniques, and the obtained results may vary significantly depending on the choice of the measurement method. In this work, a complete description of the thermal crystallization event of nanocrystalline BiFeO3 has been performed by combining the information obtained from three different experimental techniques: in situ high-temperature X-ray diffraction, transmission electron microscopy, and differential scanning calorimetry. Interestingly, the kinetic analysis of the X-ray diffraction and differential scanning calorimetry data yields almost identical results, although the physical properties measured by both techniques are different. This allows the unambiguous determination of the kinetic parameters. The importance of a proper definition of the conversion degree, which is limited by the employed measurement technique, is also highlighted. A novel fine-grained orthorhombic ZrO2 ceramic stabilized with 12 mol% Ta doping was fabricated by spark plasma sintering from home-made powders, and its high-temperature mechanical properties evaluated for the first time by compressive creep tests in both Ar and air. It was found that the high-temperature plasticity of the ceramic deformed in Ar, under which the Ta-doped orthorhombic ZrO2 is a black suboxide with abundant oxygen vacancies in its crystal structure, is controlled by grain boundary sliding (stress exponent similar to 2, and activation energy similar to 780-800 kJ/mol). 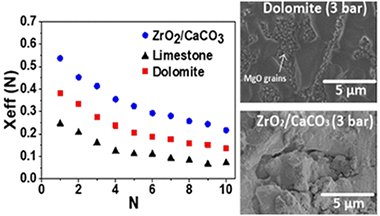 However, the high-temperature plasticity of the ceramic deformed in air, under which the Ta-doped orthorhombic ZrO2 is a white oxide due to the elimination in situ of oxygen vacancies, is controlled by recovery creep (stress exponent 3, and activation energy similar to 750 kJ/mol). It was also observed that black Ta-doped orthorhombic ZrO2 is more creep resistant than its white counterpart with the same grain size, and that the former deforms as the more conventional Y2O3-stabilized ZrO2 does.